Today we focus on these targeted areas that get stressed through everyday activity. We use this practice to combat carpal tunnel and weak wrists. This therapeutic sequence will reduce help inflammation, increase range of motion in wrists, and improve flexibility in the small muscles of the hands, fingers and forearms. This short session is the perfect moment to check in and care for yourself! Bookmark this practice and repeat to release built-up stress in these targeted areas. Preventative care is the best care! Let me know how it goes in the comment section down below! WANT MORE YOGA FOR WRISTS? Just wanted to say a big thank you to you all for your dedication in providing the platform to get reconnected with Yoga again. I took part in some of your other challenges and have enjoyed them all. I especially wanted to do this with you this year as we launch our new Yoga retreats here on our farm here in South Africa. We are an off the grid farm in the mountains surrounded by forests. My husband and I have been living here for nearly nine years with a vision of attracting people to come enjoy our space and be one with nature. After many years we now have the platform and facilities for 8 people to come and enjoy not only the Garden Route of South Africa but also to experience a conscious living farm where we grow our own food, catch our rain water and work with nature. Spending time with you on the mat everyday has allowed me to get ready for the journey ahead and awaken the love I have for yoga. As you say getting on the mat is probably the hardest part. Thank you for being such a wonderful, inspirational and loving teacher to us all. May you go from strength to strength. See you on the mat. Adriene you ‘re wonderful. Thank you All! Keep On!!! Nice stretch. I’m hoping this will help my arthritic shoulders that radiate down to my hands. To find your voice – it’s helpful to be in your body. If you are in your body and have faith in your voice, you can make this relationship strong enough to make positive, lasting change. I have always thought that yoga was boring until I started your “30 days of yoga” 2 years ago. And now I can’t stop watching your videos and talking about you to any friend who might be interested in home practice. I believe that we all have to start working on Sustainability and we all must do our part instead of waiting for politicians to change things. So thank you once again ! Adriene, love your energy and enthusiasm! My wife and I finished the 30 day Yoga journey and thoroughly enjoyed it. Hope to integrate Yoga into our regular fitness routine. Hi my Friend… thanks for helping me reconnect to a home practice and self care… it has been since my hubby passed in 2017 that I have not practiced self live and care. So I thank you for helping me kick off 2019 on such a positive note… DEDICATING TIME FOR ME! I’ve just spent most of the day working on a computer, typing and drawing. This video was just what I needed. My hands and wrists feel so much better now! You are a star, Adriene! This was a good exercise for me today. After finishing the 30 days of Dedicate, I ate too much chocolate birthday cake and went back into A-fib 2 days ago so I have cut back on my yoga. I should be back in normal rhythm in a day or so and can get back on the mat. Thank you. I really enjoyed Dedicate (except for the pretzel parts). I do not think these old joints could ever twist like that. Must be a male thing. Hey Adriene, I have just broken my wrist and have a cast in. Can you do a practice for such an eventuality? Hi, Thanks for the amazing coaching. Unfortunately I got sick during the 30 day challenge but I will keep on practicing! I really enjoyed the sessions. I thank you so much for the little wrist/hand practice today. It felt great. I know it will benefit the circulation problem I have in my wrists, and I will try to do it regularly. I do a moderate amount of dance exercise, and was very grateful for the 30-day Yoga Dedicate series, a beautiful and necessary supplement for me. And I got to find out about you for the first time! It got me back into yoga again. You are a breath of fresh air – you are sweet, honest and kind. Every time I’m on the mat I wonder why I ever left. My husband also died in 2017, and anyone who has lost someone they loved so dearly knows that self-care is critically essential. I was intending to see if you have a video for hands, wrists and opened to your website and VOILA! Thanks for creating the perfect yoga session so I could find it in the perfect time. Your videos are wonderful and I don’t want to say anything negative, especially on a public forum, but I need to react to your newsletter sent today and I can’t find any way of doing it other than here. The text of the email itself is great as always, but I wanted to say that I really hate the quote that introduces it: “Yesterday I was clever so i wanted to change the world, Today I am wise so I am changing myself”. We are benefiting from a lot of things won over by people who, maybe unwisely but courageously, have wanted to change the world. Hopefully, we will benefit more in the future from the actions of other people who do want to change the world, such as the brave young Americans from March for our Lives or dauntless teenagers such as Greta Thunbergs who are giving their all to fight the climate crisis. I know this is not what you meant to suggest, but the quote does intimate that “wanting to change the world” is unwise and undesirable, and I find this to be a rather sad and unfortunate message. My name is Amber, and I am a Chinese student studying alone in Canada. Actually, I am going through a tough period of time and feel depressed always. Your email with the beginning ‘Dear darling Amber’ makes me feel loved and cared. I don’t know whether you can read this, but I just want to say thank you to you. Your care warms my day. Dear Adriene, I did the last day of Dedicate today and what an absolutely magical and spiritual experience it was! I discovered you through a friend last year and since then I have started practicing daily with the help of your videos. I love your beautiful spirit, witty sense of humour and off course dear old Benji. Thank you so much for opening up a whole new world of yoga home practice for me. I think you are just terrific. I think we are all trying to do the best we can and then you come along and show us in such an easy-to-swallow, funny, deep, inventive, happy, and calm way how to be a little better. To ourselves and our world. THank you. Since I discovered Yoga with Adriene, I have reconnected with yoga. I went through breast cancer and had left my yoga practice. I am back on track with you and I can’t thank you enough for being able to continue my yoga practice. My younger son has a yoga studio in Sugarland, Texas and has always encouraged me to return to my practice and thanks to you I have. You are awesome, love your sessions. Namaste! Making our days human centered limits my capacity. I find what feels good is making my days God centered. That way I’m able to leverage a greater power to be more, do more, and have more faith, hope, and love. Thanks for your energy, care, and encouragement that you put into your videos. I’m lovin’ it. really lovely on a day that i was needing something off the wrists, been combining some of your stronger practices (yoga for weight loss) with the CARE schedule. Also, being an office worker, this was much needed and i will return to it! Thank you again! Honestly, this practice had me sweating and tingling all over. I was really trying to pull those shoulders back and imagine a wall for my palms to press into. I am amazed at how much energy this practice calls for!! I just finished the first session and even though I am 79, I managed most of it. Looking forward to more. I’m so happy to have stumbled upon your videos! They make a world of difference and have led me to start reading up more on chakras. Do you think it would be possible to add overlays every now and then on the video to highlight what chakras a pose or vinyasa supports? Hi, I’m Emily. Over the past three years I ever struggled with myself. I won’t get into it but I wanted to share my gratitude to Yoga With Adriene. My counselor first introduced me to yoga and meditation, which at first was VERY hard for me to do. Then one day I came across Yoga with Adriene. It sounds cheesy but, my life was changed. It has helped me slowly learn to love myself. This is something I have never done, sadly. I found strength in myself. MYSELF. I never thought of myself as a strong person! I have learned to embrace my flaws and find the perfection in my imperfections. Yoga with Adriene has help me find the light at the end of a very long and dark tunnel. SO thank you for all you do. Wanted a little something before bed tonight. Perfect. Just wish my arthritis in my thumb area didn’t have that pain when I pulled on it. Oh well. Too many years of fiber crafts. Thank you, Adriene. My right wrist has been stiff and achy after I broke it years ago. My real question is, I just turned 64 (wake up call) and have gotten much heavier and out of shape. I have usually been 50 lbs lighter, flexible and athletic. I am now caring for my elderly mother and hanging around the house all day. What kind of yoga would you recommend for a woman my age with chronic knee and back pain? Starting simple and building up. Thank you. I really enjoy your videos. I feel better everytime i do one, but i have to be careful. Blessings! Crocheter, knitter, spinner! I am 55 yo. I am hoping this will help me to work in my crafts for a few more years. Thank you so much! Excellent!! Thank you so much. Hi Adriene – found your site by accident and have started the exercises hoping to alleviate arthritic hands so I can play my guitar again! 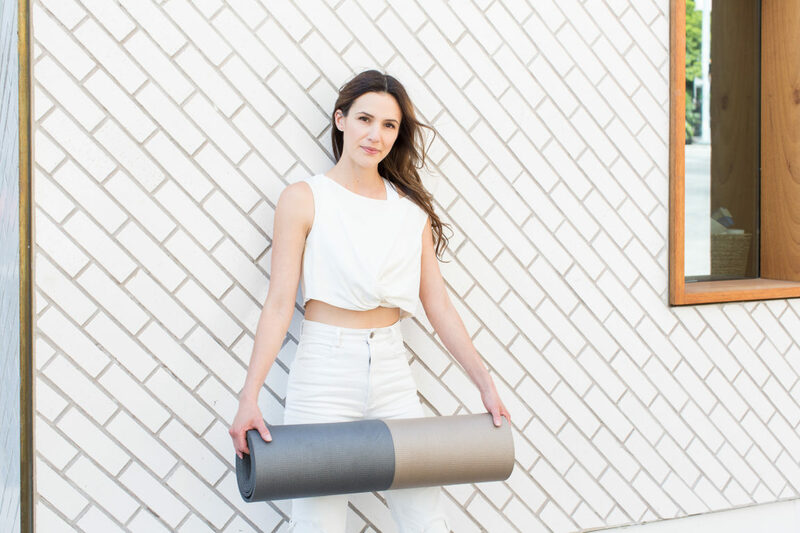 Adriene Mishler is an actress, yoga teacher and entrepreneur from Austin, Texas.